Wood is generally easy to find and work with so wherever wood is found you will find wooden beads. Regional carpenters and carvers use the most readily available species of wood and beadmaking itself was used as exercises for apprentices or as spare time work for journeymen or masters. 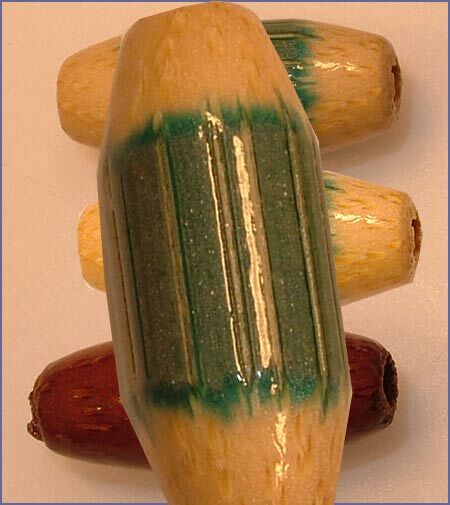 This wide variety of woodworkers and woods makes for an astonishing variety of forms, sizes, and types of wood beads. 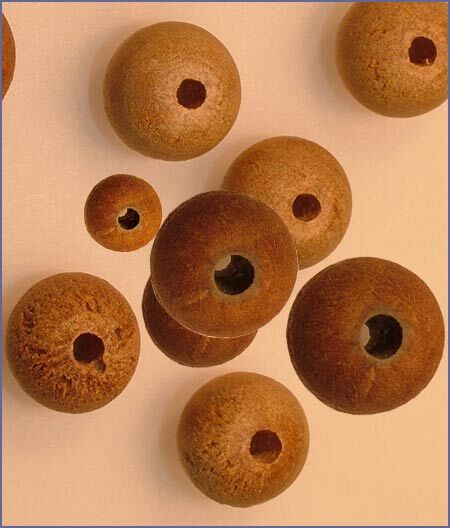 Unfortunately, because these wooden beads are so common they are taken for granted. The amount of printed material on the subject of wood beads is few and far between and the study of common wood beads is not considered a proper subject for serious bead researchers. Much of the background for this article was found on the World Wide Web as advertising banners. Other sources on the Web treat wood beads as adjunct to information on prayer beads or abacus, because they incorporate wooden beads into the finished product. Many species of trees provide material for wood beads. These include olive, sandalwood, bamboo, bayong, ebony, ironwood, palm, apple, pear, and rose, to name but a few. All of these types of wood have been used for beads either because the grain of the wood is beautiful or because the wood is aromatic. Olive trees have a natural red grain that is wavy and the heart wood darkens and hardens with age to produce an elegant pattern. The heart wood comes from olive trees which are pruned each year after harvest and the pruned wood is used for decorative carvings and beads. 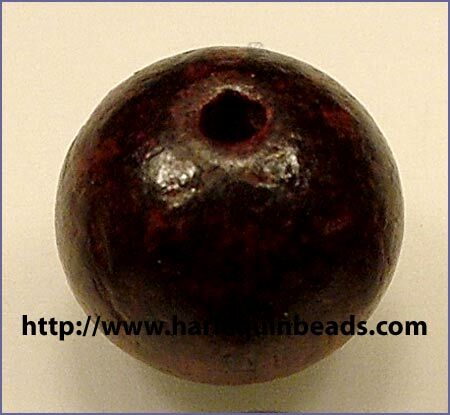 Sandalwood beads are light both in color and weight and they have a distinctive soothing aroma. Among Hindus, sandalwood is believed to bring clear perception to the wearer. Rosewood is great for making beads, it is dark and heavy and dense and its grain appears in subtle lines of black and dark brown. Rosewood beads are said to strengthen the aura and ward away negative energy. Wooden beads are cherished for a variety of reasons beside beauty and aroma. Some woods are prized because they are considered sacred like that of the bodhi tree, where the Buddha found enlightenment. Most exotic wood beads originate in the Middle East or southern Asia, but Europe is also a source of wood beads. The Czech Republic produces inexpensive pine and bass wood beads for children's toys and macramé crafters, as well as inexpensive wood beads you'd find in bead shops worldwide. As with all forms of beads there are a few dedicated artists here in America and elsewhere who revel in making their own wooden beads. These artists collect exotic woods from around the world and carve exquisite and unique types.